Migrating your Oracle Discoverer reports is a complicated process not devoid of surprises. The conversion process requires too much time and manual effort, and you may be surprised to find you have far more reports in your environment that initially estimated (most of which could be outdated or duplicates with one or two minor changes). 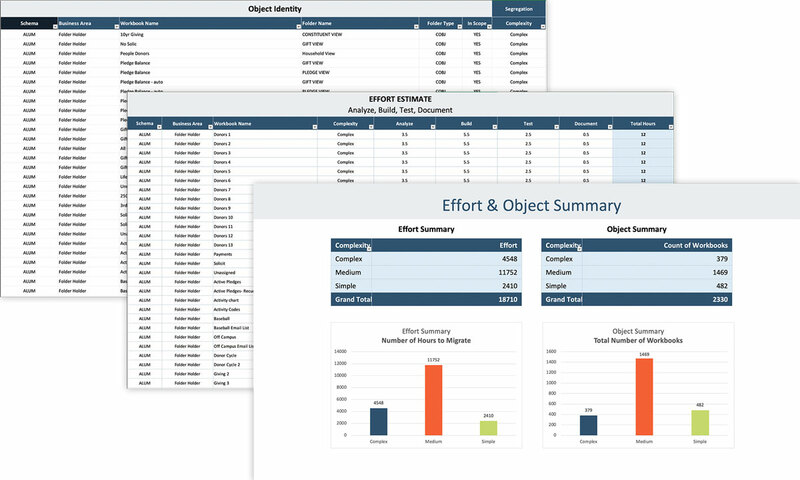 ennVee's free 1-week migration assessment automatically identifies all Discoverer reports and builds a complete migration project plan to help you save time and eliminate uncertainty. Fixed-bid or not-to-exceed pricing options to migrate to your platform of choice. 1 Discoverer report is converted and enhanced in your platform of choice. Identify all Discoverer reports, workbooks, worksheets, business areas, etc. Automatically extract the reports SQL from Discoverer. Migrate or convert the reports "as-is" to your target platform. Test and enhance the migrated reports before deploying to production.